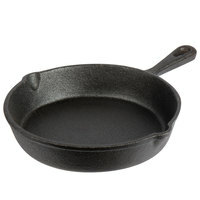 Whether you’re baking cornbread or searing a steak, cast iron cookware is perfect for the job. This material is known for its ability to retain very high heat, so you can sear meat on your range top and use the same cookware in the oven without worrying about warping. Because cast iron is both affordable and virtually indestructible, adding some of these pieces to your kitchen will be an investment that lasts. We offer a range of cast iron cookware that includes griddles for searing meat, dutch ovens for frying chicken or making casseroles, and the versatile cast iron skillet, which you can use for just about anything. If you don’t want to deal with seasoning your cookware, we also have porcelain enameled options that are more low maintenance. 6 1 - 2 Qt. 13 3 - 4 Qt. 13 4.6 - 6 Qt. 6 7 - 9 Qt. 22 3 - 12 Oz. 18 14 - 24 Oz. 7 25 - 176 Oz. 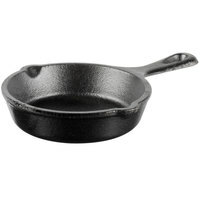 Better - This Valor 5" cast iron mini round skillet features excellent heat retention and distribution, and its durable construction is ideal for oven-to-table applications. Its extra level of finishing ensures this cast iron is smoother than traditional cast iron, for an easier release and exceptional product quality. 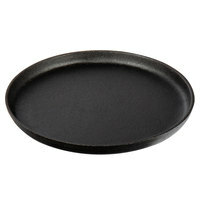 Best - Lodge's 5" round cast iron skillet can go from stovetop to oven to table with nothing but potholders! Compared to traditional cookware, Lodge's patented heat-treating process offers unparalleled durability, ensures even heating, and inhibits rust from forming. Plus, it comes pre-seasoned, which allows you to save time preparing your food as well as enables you to cook healthier by limiting the amount of oil needed to prepare each dish. This skillet, due to its American-made construction and pre-seasoned finish, is a better option for cast iron cookware and is offered at a very affordable price! 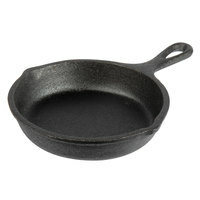 Better - This Valor 3 1/2" cast iron mini round skillet features excellent heat retention and distribution, and its durable construction is ideal for oven-to-table applications. Its extra level of finishing ensures this cast iron is smoother than traditional cast iron, for an easier release and exceptional product quality. 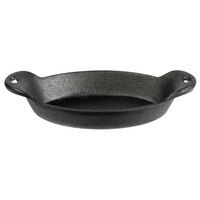 Best - This Lodge LMS3 3 1/2" round pre-seasoned cast iron individual serving mini skillet provides a heavy-duty option for your oven-to-table appetizers and desserts. Lodge's cast iron products are American-made, with European brand performance, providing longevity in even the harshest environments at an affordable price. Good - Boasting an easy-release pre-seasoning, the Choice 9 1/4" x 7" cast iron fajita skillet is a great economical choice for your business. The long handle provides effortless use in your busy kitchen, while the cast iron construction allows you to take it straight from the oven to the table for a dynamic presentation. Better - This Valor 9 1/4" x 7" pre-seasoned cast iron oven sizzler features excellent heat retention and distribution, and its durable construction is ideal for oven-to-table applications. Its extra level of finishing ensures this cast iron is smoother than traditional cast iron, for an easier release and exceptional product quality. 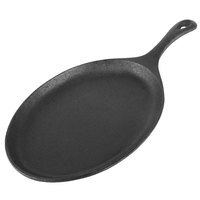 Best - This Lodge LOS3 10" x 7 1/2" cast iron oval fajita skillet provides a heavy-duty option for your oven-to-table appetizers and entrees. Lodge's cast iron products are American-made, with European brand performance, providing longevity in even the harshest environments at an affordable price. Better - This Valor 14 oz. cast iron round server features excellent heat retention and distribution, and its durable construction is ideal for oven-to-table applications. Its extra level of finishing ensures this cast iron is smoother than traditional cast iron, for an easier release and exceptional product quality. 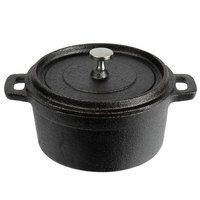 Best - Lodge's 8 1/4" round cast iron mini server can go from stovetop to oven to table with nothing but potholders! Compared to traditional cookware, Lodge's patented heat-treating process offers unparalleled durability, ensures even heating, and inhibits rust from forming. Plus, it comes pre-seasoned, which allows you to save time preparing your food as well as enables you to cook healthier by limiting the amount of oil needed to prepare each dish. This 14 oz. capacity skillet, due to its American-made construction and pre-seasoned finish, is a better option for cast iron cookware and is offered at a very affordable price! Good - Boasting an easy-release pre-seasoning, the Choice 6 1/2" cast iron skillet is a great economical choice for your business. The pour spouts and long handle provide effortless use in your busy kitchen, while the cast iron construction allows you to take it straight from the oven to the table for a dynamic presentation. 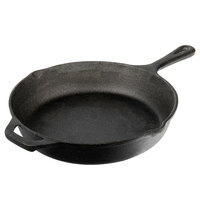 Better - This Valor 6 1/2" pre-seasoned cast iron skillet features excellent heat retention and distribution, and its durable construction is ideal for oven-to-table applications. Its extra level of finishing ensures this cast iron is smoother than traditional cast iron, for an easier release and exceptional product quality. Best - Use the Lodge L3SK3 6 1/2" pre-seasoned cast iron skillet to provide a heavy-duty option for your oven-to-table appetizers and entrees. Lodge's cast iron products are American-made, with European brand performance, providing longevity in even the harshest environments at an affordable price. Good - Boasting an easy-release pre-seasoning, the Choice 9 1/4" x 7" cast iron fajita skillet is a great economical choice for your business. The shallow design with raised edges provides effortless use in your busy kitchen, while the cast iron construction allows you to take it straight from the oven to the table for a dynamic presentation. Better - This Valor 9" x 7" pre-seasoned cast iron oven sizzler features excellent heat retention and distribution, and its durable construction is ideal for oven-to-table applications. Its extra level of finishing ensures this cast iron is smoother than traditional cast iron, for an easier release and exceptional product quality. Best - This Lodge LOSH3 10" x 7" pre-seasoned cast iron oval fajita skillet provides a heavy-duty option for your oven-to-table appetizers and entrees. Lodge's cast iron products are American-made, with European brand performance, providing longevity in even the harshest environments at an affordable price. Good - Boasting an easy-release pre-seasoning, the Choice 16 1/2" x 9 1/2" cast iron reversible griddle is a great economical choice for your business. You can use one side to get those classic grill marks on your food, or the other flat side for a smooth cast iron cooking surface. Better - This Valor 21" x 11" pre-seasoned cast iron reversible griddle features excellent heat retention and distribution, and its durable construction is ideal for long-lasting use in your commercial kitchen. Its extra level of finishing ensures this cast iron is smoother than traditional cast iron, for an easier release and exceptional product quality. 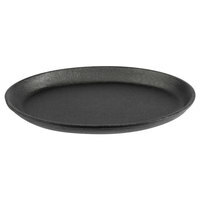 Best - Use the Lodge LPG13 20" x 10 1/2" x 3/4" pre-seasoned cast iron reversible griddle to provide a heavy-duty option for cooking your savory appetizers and entrees. Lodge's cast iron products are American-made, with European brand performance, providing longevity in even the harshest environments at an affordable price. Better - This Valor 9 oz. cast iron mini oval server features excellent heat retention and distribution, and its durable construction is ideal for oven-to-table applications. Its extra level of finishing ensures this cast iron is smoother than traditional cast iron, for an easier release and exceptional product quality. Best - This Lodge HMSOV 9 oz. 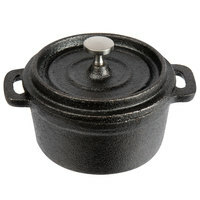 cast iron mini server provides a heavy-duty option for your oven-to-table appetizers and desserts. Lodge's cast iron products are American-made, with European brand performance, providing longevity in even the harshest environments at an affordable price. Better - This Valor 17" cast iron round skillet with 2 loop handles features excellent heat retention and distribution, and its durable construction is ideal for oven-to-table applications. Its extra level of finishing ensures this cast iron is smoother than traditional cast iron, for an easier release and exceptional product quality. 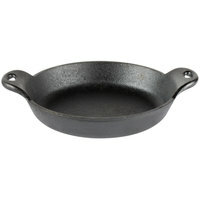 Best - This Lodge L17SK3 17" cast iron skillet provides a heavy-duty option for your oven-to-table appetizers and entrees. Lodge's cast iron products are American-made, with European brand performance, providing longevity in even the harshest environments at an affordable price. 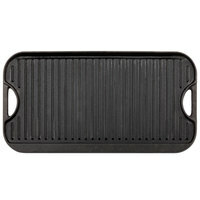 Better - This Valor 11" x 7" cast iron rectangular sizzler features excellent heat retention and distribution, and its durable construction is ideal for oven-to-table applications. Its extra level of finishing ensures this cast iron is smoother than traditional cast iron, for an easier release and exceptional product quality. Best - This Lodge Lodge LSCP3 11 5/8" x 7 3/4" pre-seasoned cast iron fajita skillet provides a heavy-duty option for your oven-to-table appetizers and entrees. Lodge's cast iron products are American-made, with European brand performance, providing longevity in even the harshest environments at an affordable price. Good - Boasting an easy-release pre-seasoning, the Choice 8" cast iron skillet is a great economical choice for your business. The pour spouts and long handle provide effortless use in your busy kitchen, while the cast iron construction allows you to take it straight from the oven to the table for a dynamic presentation. Better - This Valor 8" pre-seasoned cast iron skillet features excellent heat retention and distribution, and its durable construction is ideal for oven-to-table applications. Its extra level of finishing ensures this cast iron is smoother than traditional cast iron, for an easier release and exceptional product quality. Best - Use the Lodge L5SK3 8" pre-seasoned cast iron skillet to provide a heavy-duty option for your oven-to-table appetizers and entrees. Lodge's cast iron products are American-made, with European brand performance, providing longevity in even the harshest environments at an affordable price. Better - This Valor 10 oz. 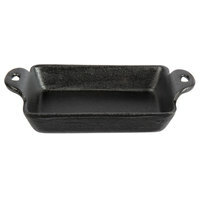 cast iron mini rectangular server features excellent heat retention and distribution, and its durable construction is ideal for oven-to-table applications. Its extra level of finishing ensures this cast iron is smoother than traditional cast iron, for an easier release and exceptional product quality. Best - Lodge's 7 1/2" x 4 1/4" rectangular cast iron mini server can go from stovetop to oven to table with nothing but potholders! Compared to traditional cookware, Lodge's patented heat-treating process offers unparalleled durability, ensures even heating, and inhibits rust from forming. Plus, it comes pre-seasoned, which allows you to save time preparing your food as well as enables you to cook healthier by limiting the amount of oil needed to prepare each dish. This 10 oz. capacity server, due to its American-made construction and pre-seasoned finish, is a better option for cast iron cookware and is offered at a very affordable price! Better - This Valor 18 oz. pre-seasoned cast iron round server features excellent heat retention and distribution, and its durable construction is ideal for oven-to-table applications. Its extra level of finishing ensures this cast iron is smoother than traditional cast iron, for an easier release and exceptional product quality. Best - This Lodge HM16OS 16 oz. oval pre-seasoned heat-treated cast iron mini server provides a heavy-duty option for your oven-to-table appetizers and entrees. Compared to traditional cookware, this server is made of durable cast iron and has been enhanced by Lodge's patented heat-treating process to ensure incredible durability and more rust-resistance. Lodge's cast iron products are American-made, with European brand performance, providing longevity in even the harshest environments at an affordable price. 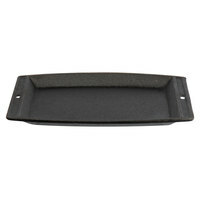 Better - This Valor 13" x 10" pre-seasoned cast iron oval sizzler features excellent heat retention and distribution, and its durable construction is ideal for oven-to-table applications. Its extra level of finishing ensures this cast iron is smoother than traditional cast iron, for an easier release and exceptional product quality. 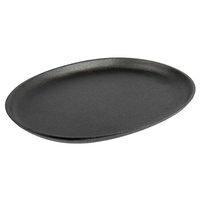 Best - This Lodge LJOSH3 13 7/8" x 10" oval pre-seasoned jumbo fajita skillet provides a heavy-duty option for your oven-to-table appetizers and entrees. Lodge's cast iron products are American-made, with European brand performance, providing longevity in even the harshest environments at an affordable price. This Valor 25 oz. 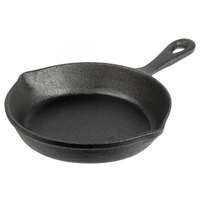 cast iron server provides a rustic, farm-to-table serving option that will charm your guests. The pre-seasoned surface allows you to use this piece immediately, while the easy-release finish means more convenient use. Loop handles make it easy to transport this server to and from guests' tables. 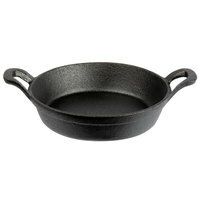 This Lodge 8" cast iron skillet is the ideal way to serve piping hot oven-to-table dishes. This skillet has excellent heat retention that allows even heat distribution to ensure perfectly cooked appetizers, entrees, or desserts every time. This skillet, due to its American-made construction and pre-seasoned finish, is a better option for cast iron cookware and is offered at a very affordable price! Good - Boasting an easy-release pre-seasoning, the Choice 12" cast iron skillet is a great economical choice for your business. The pour spouts and helper handle provide effortless use in your busy kitchen, while the cast iron construction allows you to take it straight from the oven to the table for a dynamic presentation. Better - This Valor 12" pre-seasoned cast iron skillet features excellent heat retention and distribution, and its durable construction is ideal for oven-to-table applications. Its extra level of finishing ensures this cast iron is smoother than traditional cast iron, for an easier release and exceptional product quality. Best - Use the Lodge L10SK3 12" pre-seasoned cast iron skillet to provide a heavy-duty option for your oven-to-table appetizers and entrees. Lodge's cast iron products are American-made, with European brand performance, providing longevity in even the harshest environments at an affordable price. 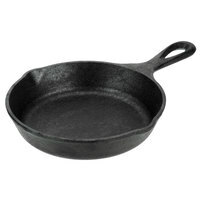 Good - Boasting an easy-release pre-seasoning, the Choice 10 1/4" cast iron skillet is a great economical choice for your business. The pour spouts and helper handle provide effortless use in your busy kitchen, while the cast iron construction allows you to take it straight from the oven to the table for a dynamic presentation. 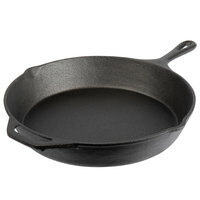 Better - This Valor 10 1/4" pre-seasoned cast iron skillet features excellent heat retention and distribution, and its durable construction is ideal for oven-to-table applications. Its extra level of finishing ensures this cast iron is smoother than traditional cast iron, for an easier release and exceptional product quality. Best - Use the Lodge L8SK3 10 1/4" pre-seasoned cast iron skillet to provide a heavy-duty option for your oven-to-table appetizers and entrees. Lodge's cast iron products are American-made, with European brand performance, providing longevity in even the harshest environments at an affordable price. Better - This Valor 9" cast iron round sizzler features excellent heat retention and distribution, and its durable construction is ideal for oven-to-table applications. Its extra level of finishing ensures this cast iron is smoother than traditional cast iron, for an easier release and exceptional product quality. 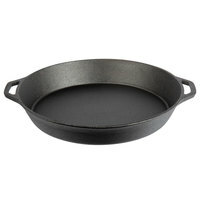 Best - This Lodge L7OGH3 9 1/4" round pre-seasoned cast iron fajita skillet provides a heavy-duty option for your oven-to-table appetizers and entrees. Lodge's cast iron products are American-made, with European brand performance, providing longevity in even the harshest environments at an affordable price. Better - This Valor 9" cast iron round skillet features excellent heat retention and distribution, and its durable construction is ideal for oven-to-table applications. Its extra level of finishing ensures this cast iron is smoother than traditional cast iron, for an easier release and exceptional product quality. 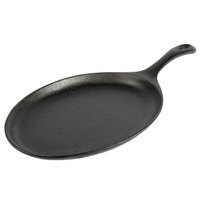 Best - ThisLodge L6SK3 9" cast iron skillet provides a heavy-duty option for your oven-to-table appetizers and entrees. Lodge's cast iron products are American-made, with European brand performance, providing longevity in even the harshest environments at an affordable price.